A stunning map with gold foiling. Made for kings. Mappe-monde Geo-Hydrographique ou Description Generale du Globe Terrestre et Aquatique en Deux-Plans-Hemipsheres ou son Exactement Remarquees en General Toutes les Parties de la Terre et de L'Eau, suivant les Relations les plus Nouvelles, par le S. Sanson Geographe Ordinaire du Roy 1691. An extraordinary map of monumental proportions, this Sanson and Jaillot's 1691 decorative map of the world on a double hemisphere projection. This is the first state of the fourth plate of this map. Covers the entire world according to its 17th century conception. Elaborate allegorical cartouches appear at top center and bottom center detailing cherubs riding dolphins - the symbols of the Dauphin of France. This map is magnificently colored with extensive gold foiling used throughout both as accent elements and to denote cities. This type of elaborate colorization theme is highly unusual as gold foil gilting and color work of this caliber was generally only applied to maps that were commissioned for royalty or the high nobility. The is the only example of this map with such colorization we have ever seen. Baja California was subsequently discovered in 1533 by Fortun Ximenez, who had been sent to the area by Hernan Cortes. When Cortez himself traveled to Baja, he must have had Montalvo's novel in mind, for he immediately claimed the Island of California for the King. By the late 16th and early 17th century ample evidence had been amassed, by explorations of the region by Francisco de Ulloa, Hernando de Alarcon and others, that California was in fact a Peninsula and not and island. However, by this time other factors were in play. Francis Drake had sailed north and claimed 'New Albion' near modern day Washington or Vancouver for England. The Spanish thus needed to promote Cortes' claim on the 'Island of California' to preempt English claims on the western coast of North America. The significant influence of the Spanish crown on European cartographers caused a major resurgence of the Insular California theory, of which Sanson was a primary proponent, in the mid to late 17th century. Shortly after this map was made Eusebio Kino, a Jesuit missionary, traveled overland from Mexico to California, proving conclusively the peninsularity of California. Traveling northwest, away from the mainland, we come across a land labeled 'Terre de Jesso' or 'Je Co.' or 'Terre de la Compagnie.' Though Yesso or Jesso is a name usually associated with Hokkaido (which here is drawn as part of mainland Asia), this land mass is more commonly called Gama or Gamaland. Gama was supposedly discovered in the 17th century by a mysterious figure known as Jean de Gama. Various subsequent navigators claim to have seen this land and it appeared in numerous maps well into the late 18th century. At times it was associated with Hokkaido, in Japan, and at other times with the mainland of North America. On this map we are struck by its uncanny resemblance to Gerhard Muller's peninsula which emerged in the late 18th century. Based on numerous sightings but no significant exploration of the Aleutian Islands, Muller postulated that the archipelago was in fact a single land mass. This he mapped extending from the North American mainland towards Asia much as the 'Terre de Compagnie' does on this map. It is not inconceivable that navigators sailing in the northern seas from Asia could have made this same error in the 16th and 17th centuries. Moving east of California into the North American mainland we find ourselves in the Spanish colony of New Mexico. Santa Fe, its capital, had been founded in 1610 and here we find it situated far to the north of its actual location, situated on the Colorado (Rio Norte) rather than the Rio Grande or Santa Fe River. It also appears near gigantic and mysterious lake named Apache. The Apache Lake is drawn as the source of the Rio Norte or Colorado River. Though the origins of this lake are somewhat mysterious, they may be associated with Native American reports of the Great Salt Lake or another lake in the region brought back by the Onate and Coronado expeditions. In the eastern part of New Mexico territory we come across the land of Quivira. Quivira, along with Cibola, was one of the Seven Cities of Gold from Spanish folklore. The story beings in 1150 when Merida, Spain, was conquered by Moors . The city's seven bishops fled the city taking with them much of the cities riches. Legend told that they each founded a great city in a far away unknown land. With the discovery of the New World and the fabulous riches plundered by Cortez and Pizarro, the Seven Cities became associated with New World legends. Coronado, hearing tales of the rich Aztec homeland of Azatlan somewhere to the north believed he was hunting for Quivira in what is today the American southwest. He was subsequently mapped and sought, though like most kingdoms of gold never found, for some 300 years before disappearing from maps in the early 19th century. To the north Sanson maps an vaguely recognizable Hudson Bay with several openings to the west. Beyond the waters of Hudson Bay and north of Insular California, Sanson leaves the largely unknown land blank, leaving open the hope of a Northwest Passage. Just to the south of the Hudson Bay we see a very embryonic mapping of the Great Lakes. Ontario, Erie, and Huron are recognizable, but both Lake Michigan and Lake Superior open speculatively to the west, again suggesting the possibility of navigable water route to the Pacific. On the Eastern coast of North America, Sanson recognizes French Claims to Canada, English claims to the Massachusetts Bay Colony, Dutch claims in New Amsterdam (New York), and Swedish claims in New Jersey. In Spanish Florida, which extends north to include most of the American Southeast, Lake Apalache or the 'Great Freshwater Lake of the American Southeast' is noted. This lake, first mapped by De Bry and Le Moyne in the mid 16th century, is a mis-mapping of Florida's Lake George. While De Bry correctly mapped the lake as part of the River May or St. John's River, cartographers in Europe erroneously associated it with the Savannah River, which instead of Flowing south from the Atlantic (Like the May), flowed almost directly from the Northwest. Lake Apalache was subsequently relocated somewhere in Carolina or Georgia, where Sanson maps it and where it would remain for several hundred years. Inching our way southward, we pass a well mapped Caribbean and once again find ourselves in a land rife with cartographic speculation. While the South American coastlands are well mapped, the interior is largely unknown. Explorers throughout the late 16th and early 17th century, enthralled by Pizarro's conquests in Peru and tales of other gold rich empires in the interior, were actively seeking El Dorado. Most Europeans believe that the most likely site of El Dorado legend was the mythical city of Manoa located by Sanson on the shores of the Lake Parima, near modern day Guyana, Venezuela, or northern Brazil. Manoa was first identified by Sr. Walter Raleigh in 1595. Raleigh does not visit the city of Manoa (which he believes is El Dorado) himself due to the onset of the rainy season, however he describes the city, based on indigenous accounts, as resting on a salt lake over 200 leagues wide. This lake, though no longer mapped as such, does have some basis in fact. Parts of the Amazon were, at the time dominated by a large and powerful Indigenous trading nation known as the Manoa. The Manoa traded the length and breadth of the Amazon. The onset of the rainy season inundated the great savannahs of the Rupununi, Takutu, and Rio Branco or Parima rives. This inundation briefly connected the Amazon and Orinoco river systems, opening an annual and well used trade route for the Manoans. The Manoans who traded with the Incans in the western Amazon, had access to gold mines on the western slopes of the Andes, and so, when Raleigh saw gold rich Indian traders arriving in Guyana, he made the natural assumption for a gold hungry European in search of El Dorado. When he asked the Orinocans where the traders were from, they could only answer, 'Manoa.' Thus did Lake Parime or Parima and the city of Manoa begin to appear on maps in the early 17th century. The would continue to be mapped in this area until about 1800. Further south Sanson maps a large and prominent Laguna de Xarayes as the northern terminus of the Paraguay River. The Xarayes, a corruption of 'Xaraiés' meaning 'Masters of the River', were an indigenous people occupying what are today parts of Brazil's Matte Grosso and the Pantanal. When Spanish and Portuguese explorers first navigated up the Paraguay River, as always in search of El Dorado, they encountered the vast Pantanal flood plain at the height of its annual inundation. Understandably misinterpreting the flood plain as a gigantic inland sea, they named it after the local inhabitants, the Xaraies. The Laguna de los Xarayes almost immediately began to appear on early maps of the region and, at the same time, almost immediately took on a legendary aspect. The Lac or Laguna Xarayes was often considered to be a gateway to the Amazon and the Kingdom of El Dorado. Crossing the Atlantic we find ourselves on the great continent of Africa. Like South America, Africa is well mapped along its shores but speculative in the interior. With regard to the course of the Nile, Sanson followed the Ptolemaic two lake's at the base of the Montes de Lune theory. Though Sanson does map both lakes, naming the western lake Zaire, he does not specifically name the Mountains of the Moon (though they are sketched in). Just south of Sanson's Lake Zaire, we encounter the Kingdom of Monomatapa. This region of Africa held a particular fascination for Europeans since the Portuguese first encountered it in the 16th century. At the time, this area was a vast empire called Mutapa or Monomotapa that maintained an active trading network with faraway partners in India and Asia. As the Portuguese presence in the area increased in the 17th century, the Europeans began to note that Monomatapa was particularly rich in gold. They were also impressed with the numerous well crafted stone structures, including the mysterious nearby ruins of Great Zimbabwe. This combination led many Europeans to believe that King Solomon's Mines, a sort of African El Dorado, must be hidden in this region. Monomotapa did in fact have rich gold mines in the 16th and 17th centuries, but most have these had been exhausted by the 1700s. Moving into Asia, Sanson offers us a fairly accurate mapping of Asia Minor, Persia and India. The Capsian Sea is corrected to a north-south axis though is a bit lumpy in form. He names numerous Silk Route cities through Central Asia including Samarkand, Tashkirgit, Bukhara, and Kashgar. Far to the north he associates Mongolia and Siberia with the Biblical lands of Gog and Magog. Sanson maps, but does not name, the apocryphal Lake of Chiamay roughly in what is today Assam, India. Early cartographers that such a lake must exist as the source of four important Southeast Asian river systems including the Irrawaddy, the Dharla, the Chao Phraya, and the Brahmaputra. This lake began to appear in maps of this region as early as the 16th century and persisted well into the mid 18th century. Its origins are unknown but may originate in a lost 16th century geography prepared by the Portuguese scholar Jao de Barros. It was also heavily discussed in the journals of Sven Hedin, who believed it to be associated with Indian mythology that a sacred lake linked several holy subcontinent river systems. There are even records that the King of Siam led an invasionary force to take control of the lake in the 16th century. Nonetheless, the theory of Lake Chimmay was ultimately disproved and it disappeared from maps entirely by the 1760s. Further east still the Korean peninsula unnaturally narrow. Just offshore the Japanese Islands emerge only to disappear and reappear on the opposite side of the map. The form of the islands approximates accuracy and Edo or Tokyo Bay is clearly recognizable. Several Japanese cities, including Yendo (Edo or Tokyo) are noted. Hokkaido is attached to the continent and the Japanese Kuril Islands extend eastward to meet up the aforementioned Gama Land or Terre de la Compagnie. Next we turn our attention to the Austral Seas. Australia itself appears as New Holland. Much of the northern and western shores, including the Gulf of Carpentaria, have been mapped but the eastern shores remain unexplored and the interior entirely unknown. Tasmania, labeled 'Terre de Diemens' appear according to its discovery and mapping by Able Tazman in 1642. A little further south and east we can encounter an extremely embryonic New Zealand. There is no trace of the a two island layout or, for that matter, a eastern shoreline. Also in evidence is the mysterious 'Terre de Quir' a gerat ladmass supposedly discovered by the 16th century Spanish navigator and religious zealot Pedro Fernandez de Quiros. Quiros set sail in search of the speculative southern continent and may in fact have discovered several important South Seas islands, however, he stopped just shy of glory and turned around shortly before sighting New Zealand. Even so, Quiros was a voracious self promoter and descriptions of his findings were circulated throughout Europe. Terre de Quir or Terre de Quiros appears on various maps of the region until put to rest by the 18th century explorations of Captain Cook. Massing at the base of the map is the speculative southern continent or 'Terre Australe'. Long before the discovery of Antarctica, the southern continent, supposedly capping the South Pole, was speculated upon by European geographers in the 16th and 17th centuries. It was thought that the globe was a place of balances and thus geographers presumed the bulk of Eurasia must be counterbalanced by a similar landmass in the Southern Hemisphere, just as, they argued, the Americas counterbalanced Africa and Europe. Many explorers in the 16th and 17th centuries sought the Great Southern continent, including Quiros, Drake, and Cook, but Antarctica itself was not truly discovered until Edward Bransfield and William Smith sighted the Antarctic Peninsula in 1820. All in all a magnificent and fascinating map of the world. The lower cartouche notes that this map was presented to the Dauphin (King of France) in 1691. Jaillot, H., Atlas Nouveau, 1691 edition. Good condition. A number of closed tears have been professionally restored. Backed with Japanese paper. Minor centerfold wear. Light foxing. 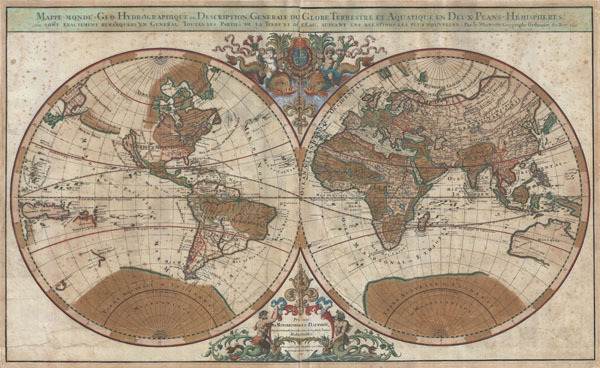 Shirley, Rodney W., The Mapping of the World: Early Printed World Maps 1472-1700, 550. Ryhiner Collection, Ryh_1101_44.